The Ford F-150 Raptor has the performance features you need to haul, tow, and handle off-road adventures. That's because this popular performance pickup truck combines a high-output engine with the technology you need to drive on any terrain. These pickup trucks come equipped with a 3.5L V6 EcoBoost engine, which generates 510 pound-feet of torque and 450 horsepower. Essential to these engines is the EcoBoost feature, which has a direct injection system for superior fuel economy. High-powered engines are a must if you want to go off the beaten track, but off-road performance is also improved by the F-150 Raptor's unique custom internal bypass technology. 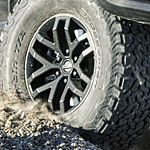 Because it provides variable dampening rates, this technology ensures smooth off-road driving. If you want a better look at the Ford F-150 Raptor, head to Tom Masano Ford Lincoln. The team at our Reading location can help you take a test drive!